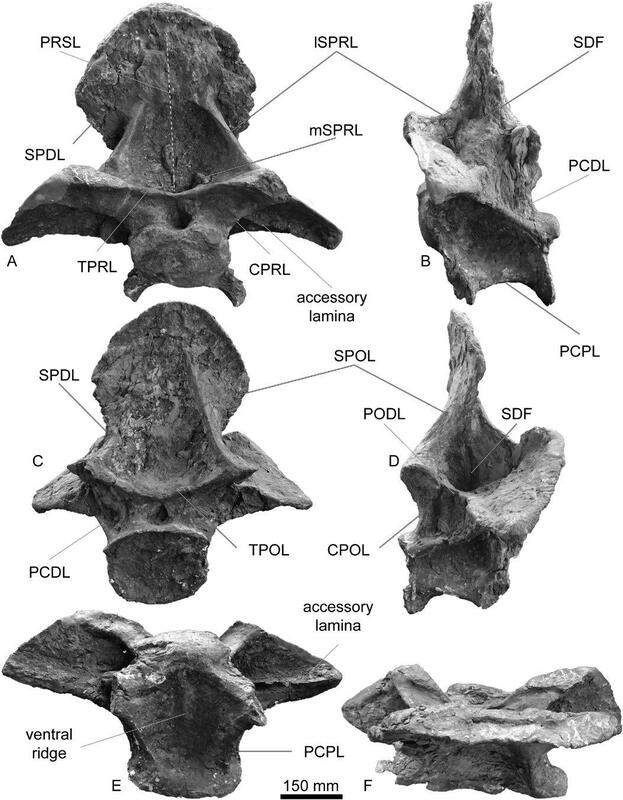 How crazy are the cervicals of Mendozasaurus? Taylor and Wedel (2013: figure 7). Disparity of sauropod cervical vertebrae. 1, Apatosaurus “laticollis” Marsh, 1879b holotype YPM 1861, cervical ?13, now referred to Apatosaurus ajax (see McIntosh, 1995), in posterior and left lateral views, after Ostrom & McIntosh (1966, plate 15); the portion reconstructed in plaster (Barbour, 1890, figure 1) is grayed out in posterior view; lateral view reconstructed after Apatosaurus louisae (Gilmore, 1936, plate XXIV). 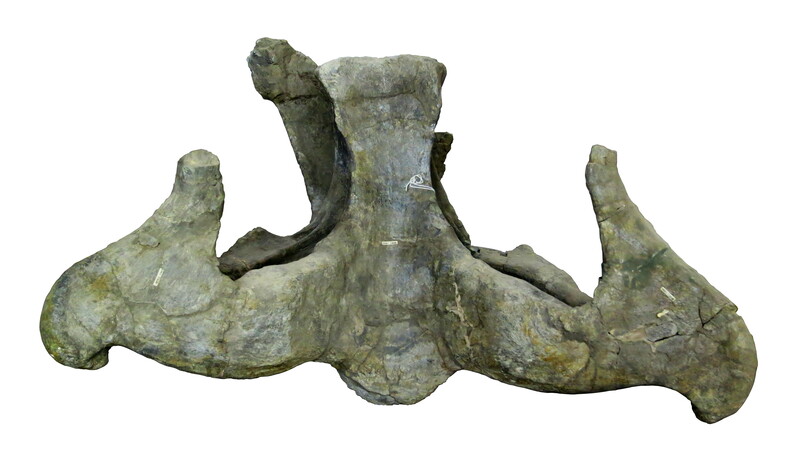 2, “Brontosaurus excelsus” Marsh, 1879a holotype YPM 1980, cervical 8, now referred to Apatosaurus excelsus (see Riggs, 1903), in anterior and left lateral views, after Ostrom & McIntosh (1966, plate 12); lateral view reconstructed after Apatosaurus louisae (Gilmore, 1936, plate XXIV). 3, “Titanosaurus” colberti Jain & Bandyopadhyay, 1997 holotype ISIR 335/2, mid-cervical vertebra, now referred to Isisaurus (See Wilson & Upchurch, 2003), in posterior and left lateral views, after Jain & Bandyopadhyay (1997, figure 4). 4, “Brachiosaurus” brancai paralectotype MB.R.2181, cervical 8, now referred to Giraffatitan (see Taylor, 2009), in posterior and left lateral views, modified from Janensch (1950, figures 43–46). 5, Erketu ellisoni holotype IGM 100/1803, cervical 4 in anterior and left lateral views, modified from Ksepka & Norell (2006, figures 5a–d). 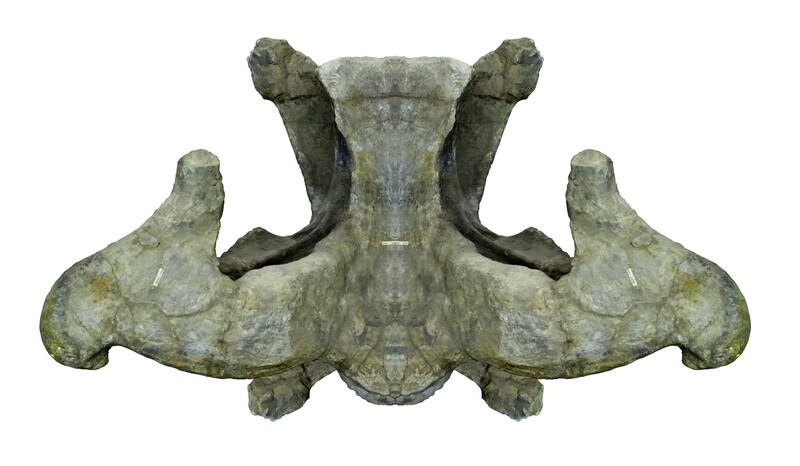 But this Mendozasaurus vertebra is crazier than any of them, with its tiny centrum, its huge, broad but anteroposteriorly flattened neural spine, and its pronounced lSPRLs. I just don’t know what to make of this, and neither does Matt. And part of the reason for this may be that neither of us has had that much to do with titanosaurs. As Matt said in email, “Those weird ballooned-up neural spines in titanosaurs kind of freak me out.” And I could not agree more. And of course as sauropodologists, we really should familiarise ourselves with titanosaurs. There are a lot of them, and they account for a lot of sauropod evolution. Someone recently made the point, either in an SV-POW! comment or on Facebook, that titanosaurs may be to sauropods what monkeys and apes are to primates: a subclade that is way more diverse than the rest of the clade put together. It’s starting to look like an extreme historical accident that Camarasaurus, diplodocines and brachiosaurids — all temporally and/or geographically restricted groups — were the first well-known sauropods, and for decades defined our notion of what sauropods were like. Meanwhile, the much more widespread and long-surviving rebbachisaurs and titanosaurs were poorly understood until really the last 25 years or so. For the first century of sauropodology, our ideas about sauropods were driven by weird, comparatively short-lived outliers. That our appreciation of titanosaur diversity has come so late says something about how our discovery of the natural world is more to do with geopolitics and the quirks of exploration than what’s actually out there. Sauropods were defined by diplodocids for so long because that’s what happened to be in the ground in the exposed rocks of North America, and that’s where the well-funded museums and expeditions were. We at SV-POW! 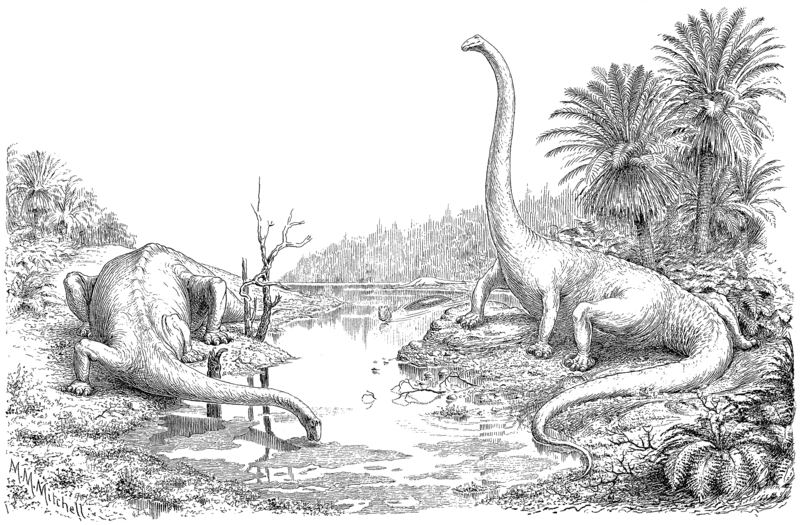 towers have often wondered how different our idea of what dinosaurs even were would be if the Liaoning deposits had been available to Buckland, Mantell, and Owen. It seems like that unavoidable that, if they’d first become familiar with feathered but osteologically aberrant (by modern standards) birds, one of two things would have happened. Either they would either have never coined the term “Dinosauria” at all, recognizing that Megalosaurus (and later Allosaurus and Tyrannosaurus) were just big versions of their little feathered ur-birds. 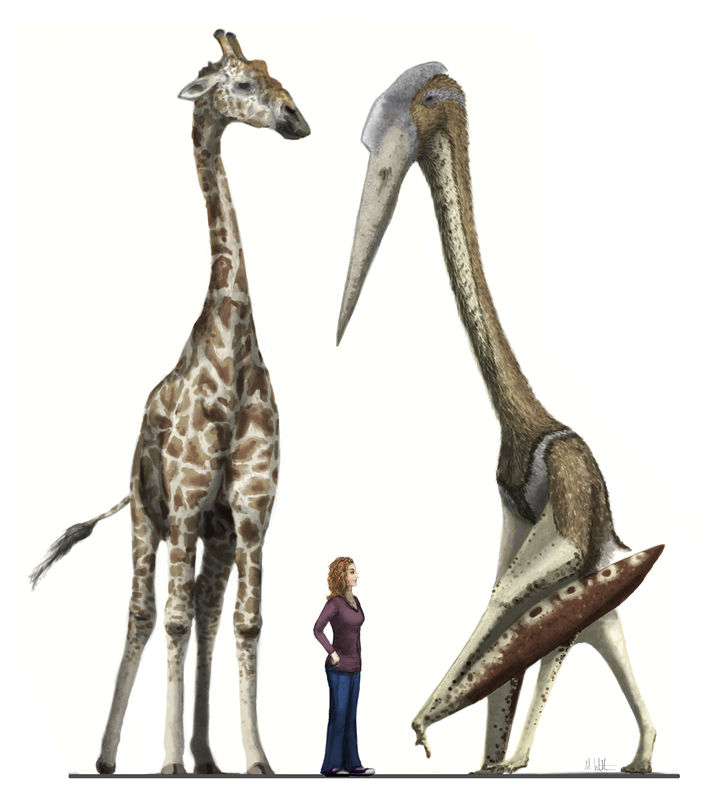 Or they would have included Dinosauria as a primitive subclass of Aves. Note. This post contains material from all three of us (Darren included), harvested from an email conversation. 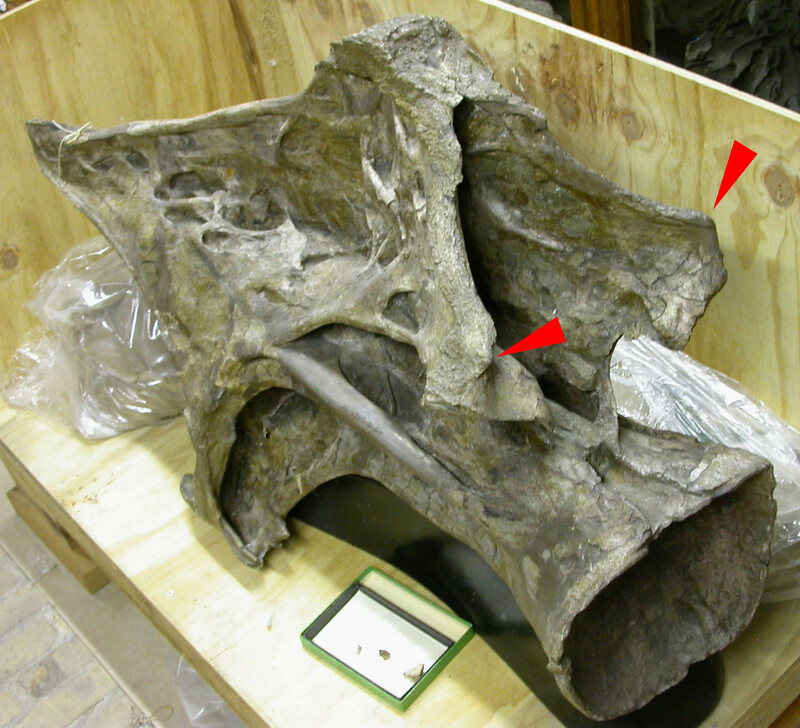 In my recent preprint on the incompleteness and distortion of sauropod neck specimens, I discuss three well-known sauropod specimens in detail, and show that they are not as well known as we think they are. 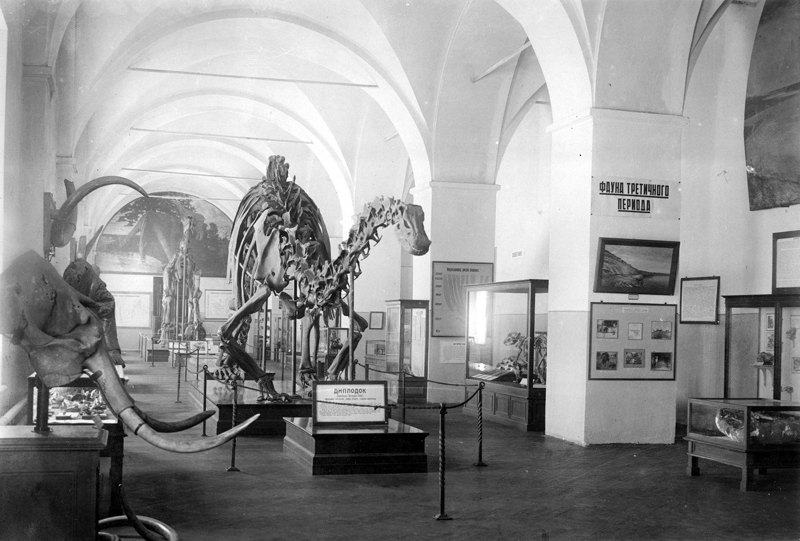 One of them is the Giraffatitan brancai lectotype MB.R.2181 (more widely known by its older designation HMN SII), the specimen that provides the bulk of the mighty mounted skeleton in Berlin. 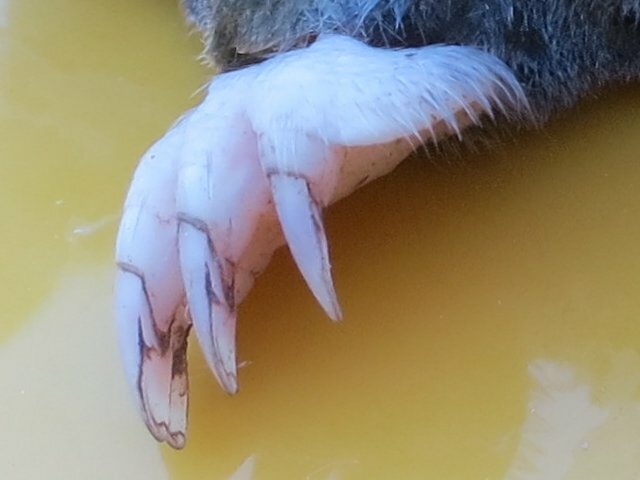 That photo is from this post, which is why it’s disfigured by red arrows pointing at its epipophyses. But the vertebra in question — the eighth cervical of MB.R.2181 — is a very old friend: in fact, it was the subject of the first ever SV-POW! post, back in 2007. Taylor 2015: Figure 5. 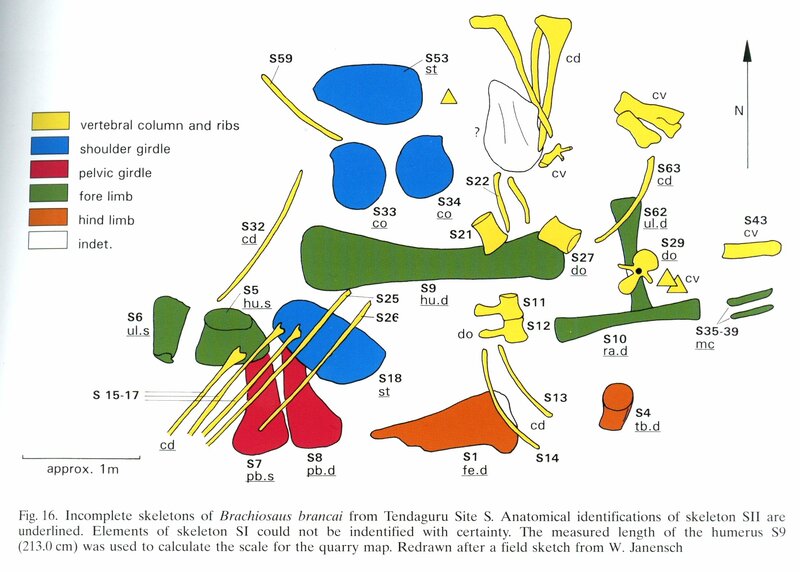 Quarry map of Tendaguru Site S, Tanzania, showing incomplete and jumbled skeletons of Giraffatitan brancai specimens MB.R.2180 (the lectotype, formerly HMN SI) and MB.R.2181 (the paralectotype, formerly HMN SII). 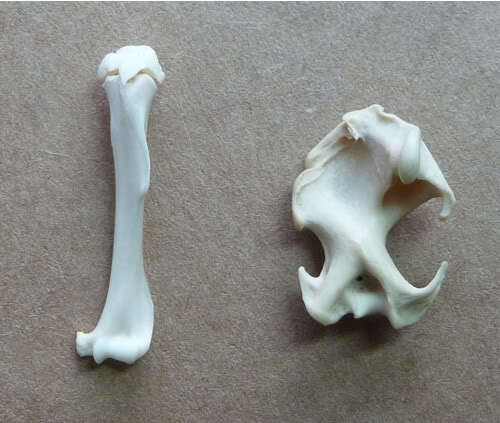 Anatomical identifications of SII are underlined. Elements of SI could not be identified with certainty. From Heinrich (1999: figure 16), redrawn from an original field sketch by Werner Janensch. For the preprint, as for this blog-post (and indeed the previous one), I just went right ahead and included it. But the formal version of the paper (assuming it passes peer-review) will by very explicitly under a CC By licence, so the right thing to do is get formal permission to include it under those terms. So I’ve been trying to get that permission. What a stupid, stupid waste of time. We are not the right persons for your question. The Wiley Company holds the copyright and should therefore be asked. Unfortunately, I do not know who is the correct person. We are currently experiencing a large volume of email traffic and will deal with your request within the next 15 working days. 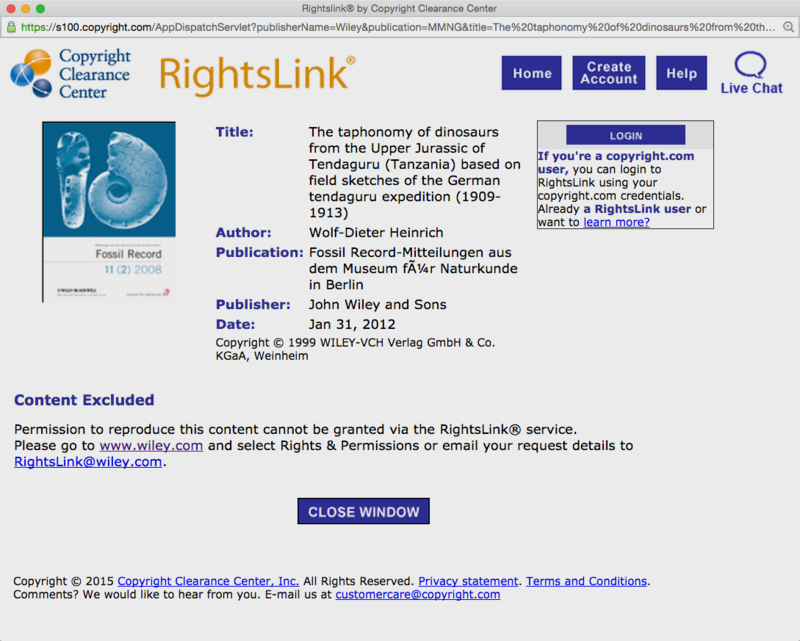 We are pleased to advise that permission for the majority of our journal content, and for an increasing number of book publications, may be cleared more quickly by using the RightsLink service via Wiley’s websites http://onlinelibrary.wiley.com and www.wiley.com. 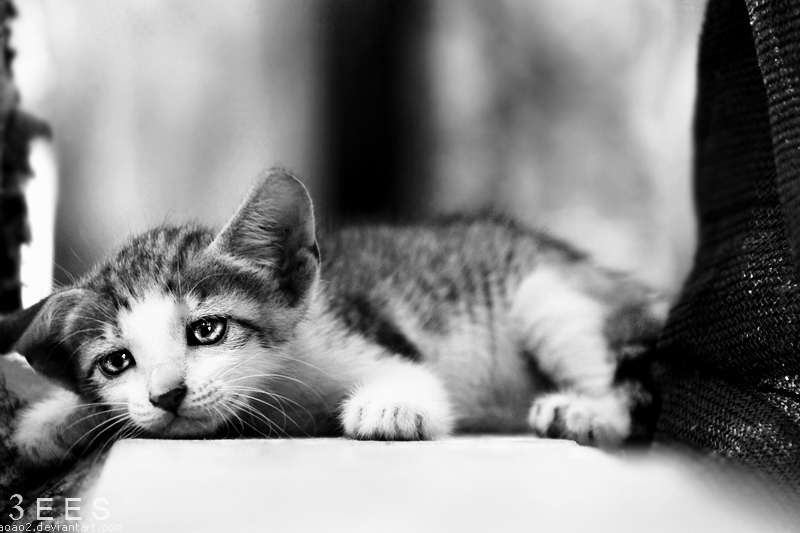 Within the next fifteen working days? That is, in the next three weeks? How can it possibly take that long? Are they engraving their response on a corundum block? So, OK, let’s follow the automated suggestion and try RightsLink. I went to the Wiley Online Library, and searched for journals whose names contain “naturkunde”. Only one comes up, and it’s not the right one. So Wiley doesn’t admit the existence of the journal. Well, there’s lots to enjoy here, isn’t there? First, and most important, it doesn’t actually work: “Permission to reproduce this content cannot be granted via the RightsLink service.” Then there’s that cute little registered-trademark symbol “®” on the name RightsLink, because it’s important to remind me not to accidentally set up my own rights-management service with the same name. In the same vein, there’s the “Copyright © 2015 Copyright Clearance Center, Inc. All Rights Reserved” notice at the bottom — copyright not on the content that I want to reuse, but on the RightsLink popup itself. (Which I guess means I am in violation for including the screenshot above.) 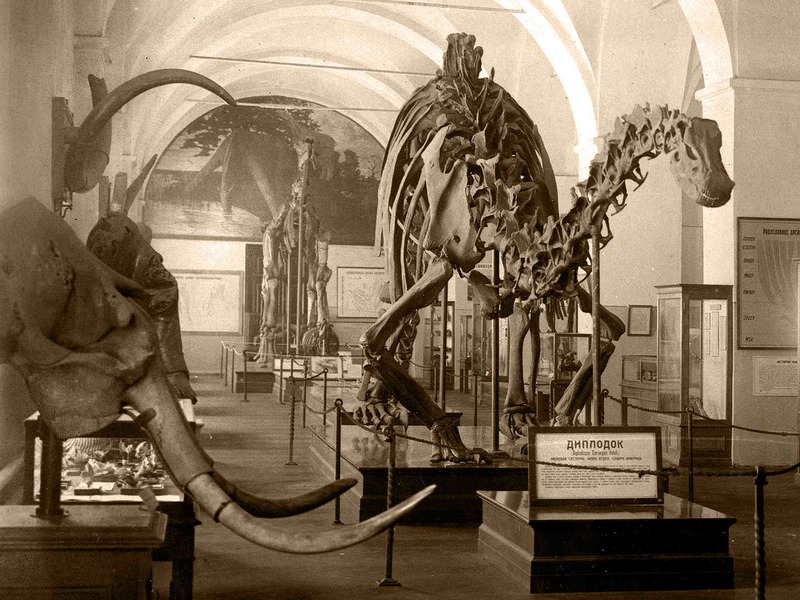 Oh, and there’s the misrendering of “Museum für Naturkunde” as “Museum fÃ¼r Naturkunde”. All of this gets me precisely nowhere. As far as I can tell, my only recourse now is to wait three weeks for Wiley to get in touch with me, and hope that they turn out to be in favour of science. Promoting the Progress of Science and useful Arts, indeed. We hereby grant permission for the requested use expected that due credit is given to the original source. If material appears within our work with credit to another source, authorisation from that source must be obtained. – Journals: Author(s) Name(s): Title of the Article. Name of the Journal. Publication year. Volume. Page(s). Copyright Wiley-VCH Verlag GmbH & Co. KGaA. Reproduced with permission. So this is excellent. I would of course have included all those elements in the attribution anyway, with the exception that it might not have occurred to me to state who the copyright holder is. But there is no reason to object to that. So, two cheers for Wiley on this occasion. 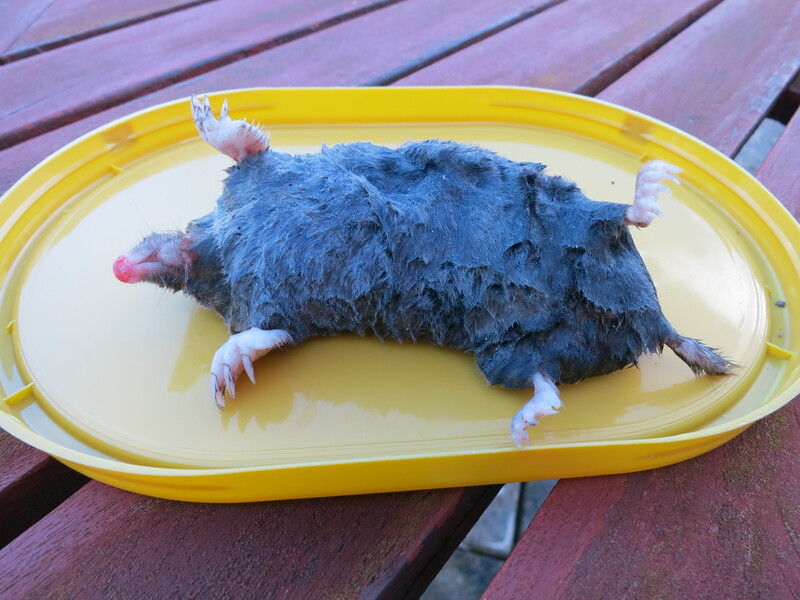 I had to waste some time, but at least none of it was due to deliberate obstructiveness, and most importantly they are happy for their figure to be reproduced under CC By. Heinrich, Wolf-Dieter. 1999. The taphonomy of dinosaurs from the Upper Jurassic of Tendaguru, Tanzania (East Africa), based on field sketches of the German Tendaguru expedition (1909-1913). Mitteilungen aus dem Museum fur Naturkunde in Berlin, Geowissenschaftliche Reihe 2:25-61. 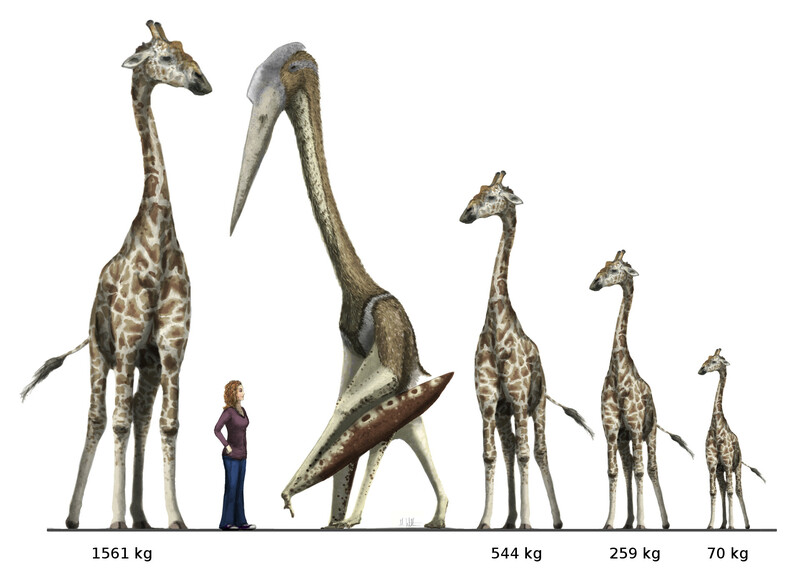 How heavy was Giraffatitan brancai? I mean, really? 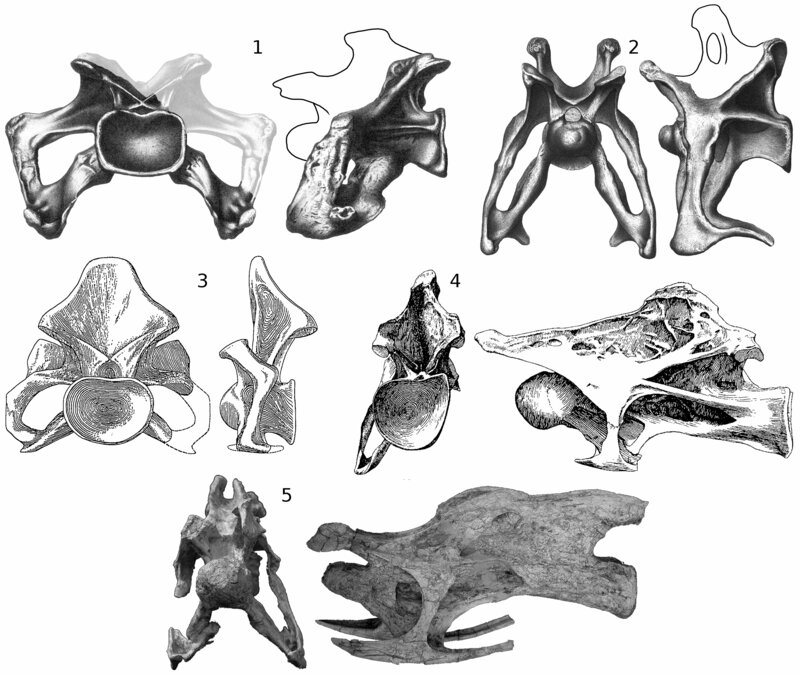 We’ve touched on this several times in various posts and comment threads, but it’s worth taking a moment to think in detail about the various published mass estimates for the single specimen MB.R.2181 (formerly known as HMN SII), the paralectotype of Giraffatitan brancai, which is the basis of the awesome mounted skeleton in Berlin. I’ve not even tried to put a regression line through this: the outliers are so extreme they’d render it pretty much useless. In fact, the lowest and highest estimates differ by a factor of 5.75, which is plainly absurd. 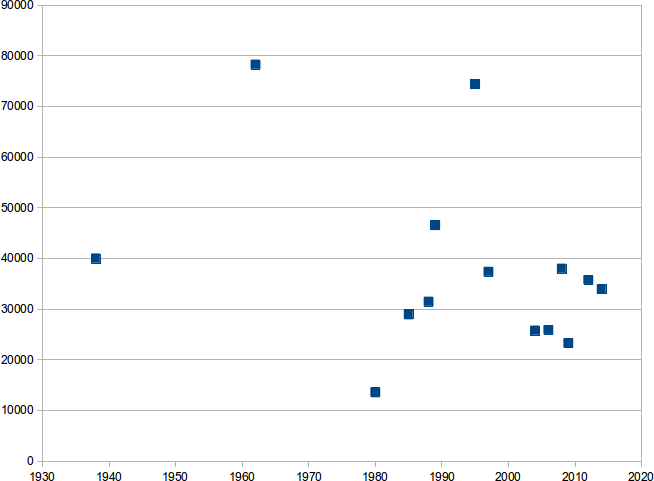 But we can go some way to fixing this by discarding the outliers. We can dump Colbert (1962) and Alexander (1989) as they used overweight toys as their references. We more or less have to dump Russell et al. (1980) simply because it’s impossible to take seriously. (Yes, this is the argument from personal incredulity, and I don’t feel good about it; but as Pual (1988) put it, “so little flesh simply cannot be stretched over the animal’s great frame”.) And we can ignore Gunga et al. (1995) because it used circular conic sections — a bug fixed by Gunga et al. (2008) by using elliptical sections. With these four unpalatable outliers discarded, our highest and lowest estimates are those of Gunga et al. (2008) at 38,000 kg and Taylor (2009)at 23,337. 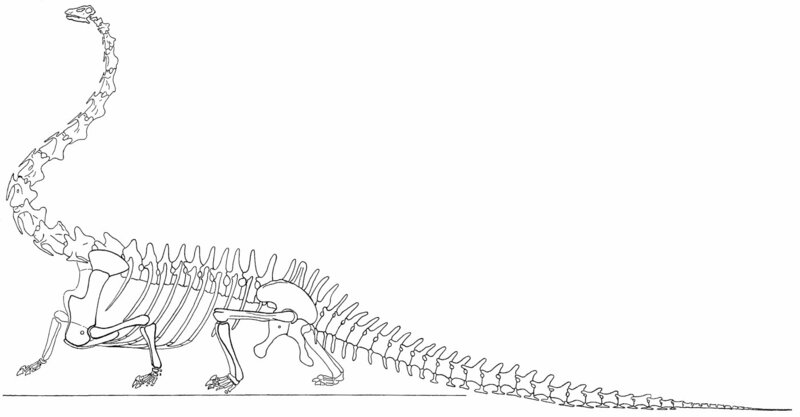 The former should be taken seriously as it was done using photogrammetrical measurements of the actual skeletal mount. And so should the latter because Hurlburt (1999) showed that GDI is generally the least inaccurate of our mass-estimation techniques. That still gives us a factor of 1.63. That’s the difference between a lightweight 66 kg man and and overweight 108 kg. 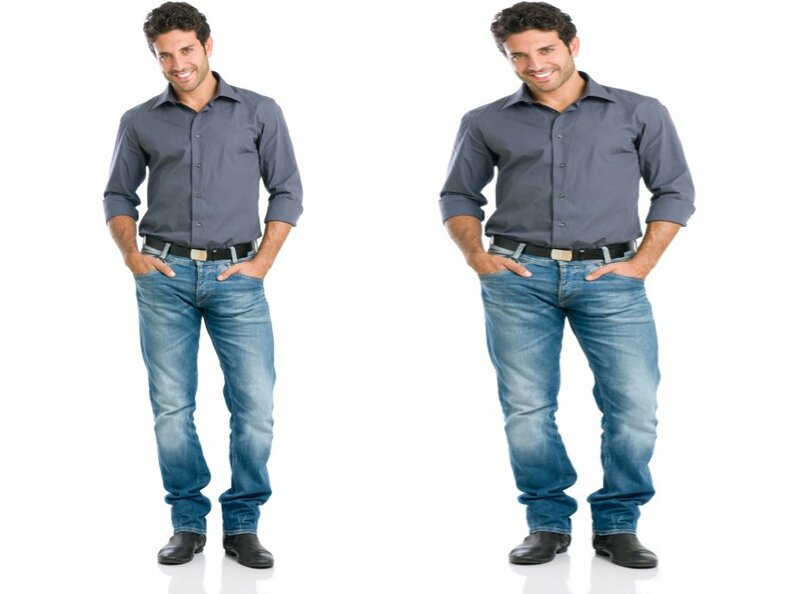 I would call that a very noticeable difference. You wouldn’t expect someone estimating the mass of one of these men to come up with that of the other. So what’s going on here? I truly don’t know. 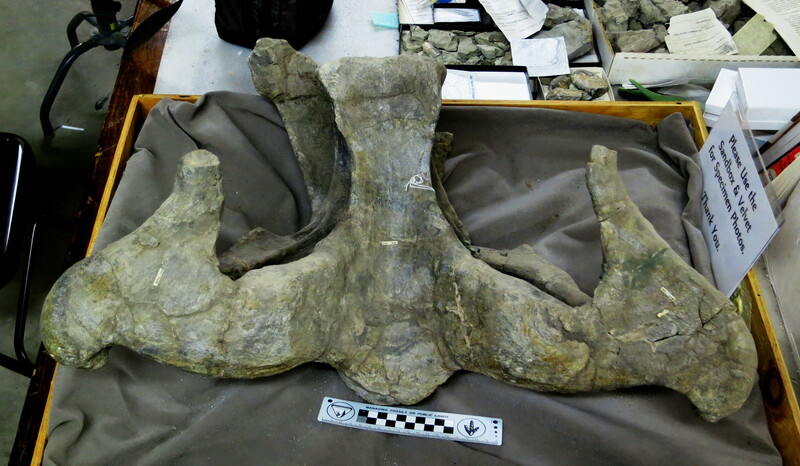 We are, let’s not forget, dealing with a complete skeletal mount here, one of the very best sauropod specimens in the world, which has been extensively studied for a century. Yet even within the last six years, we’re getting masses that vary by as much as the two dudes above.